I've been a little sidetracked lately, here is the result! 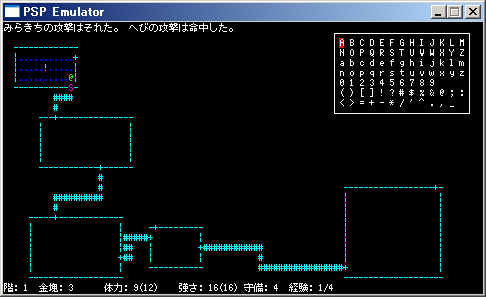 I know people who would buy a PSP just to run Nethack if anyone ever got it working! But at the same time there are people who are intent on cracking the PSP to allow pirate games to be run, and this is a bad thing for everyone. There is no 'excuse' for cracking games on the PSP since there is no region encoding (just import games you can't get in your country). If this continues (and it will) then Sony will have no choice but to close all the avenues that currently allow homebrew to run - which will be a sad thing for those of us who *want* to see things like Nethack on our PSP's while also playing the latest PSP games.